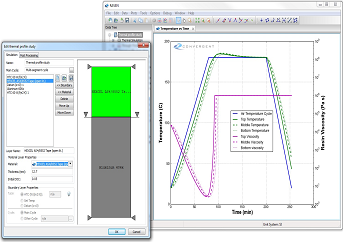 Easy-to-use software for simulation of composites processing. Quickly evaluate temperature and material property evolution of composite laminates on tools. Powerful set-up, plotting, and inspection methods make analysis simple and fast. Suitable for most polymer matrix composites processes once the fiber and matrix have been combined into a composite. Both thermoset and thermoplastic matrix materials are supported. Make your processes more efficient. Quickly evaluate how critical material properties such as degree of cure, viscosity, and glass transition temperature evolve during the cure cycle. Shorten cycle time and design more robust cure cycles based on simulations of material property evolution for different process cycles. Design more efficient tooling that balances requirements of low thermal mass and good exotherm control in order to meet cure cycle specifications and reduce cycle time. Trouble-shoot problems with existing processes by identifying root causes through simulation and evaluate solution strategies. Evaluate the ability of different part, tool, and process equipment combinations to meet cure cycle specifications through simulation. Reduce the amount of testing and trial-and-error to save time and cost. RAVEN is a free-standing software that runs under Microsoft Windows. 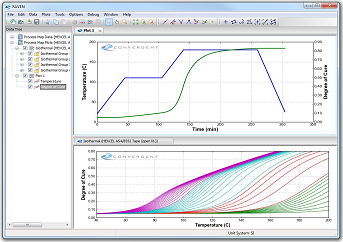 The software includes everything you need to perform quick and simple process simulation. A 0D simulation returns critical material properties as function of time for a prescribed cure cycle at a material point. A 1D simulation allows you to evaluate the effect of tool and part thickness, and heat transfer boundary conditions on the temperature profile and property evolution through the thickness of a tool-part assembly. The table below outlines what is required to perform 0D, 1D, and 2D simulations with RAVEN. for curing materials Some open and generic Material Data Sets included with software. Convergent develops material data sets on demand as a service. Temperature Cycle User specified or imported from experimental data. for non-curing materials Thermo-physical properties for common tooling and other materials included with software. Part and Tool Thickness User specified. Characteristics User specified. 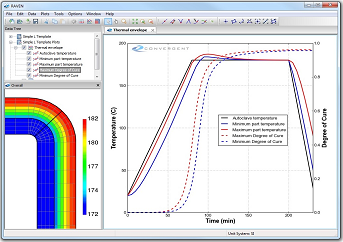 Guidelines for typical convective heat transfer coefficients in autoclaves and ovens included with software. User specified. Dynamic templates are available to model simple, configurable shapes. More complex static 2D templates can included upon request as a complimentary service. The table below shows the Material Data Sets for curing materials required to perform simulations with RAVEN and COMPRO 3D. Data sets are developed for neat resins and converted to ply properties using micro-mechanics models. Required for cure and material property evolution simulations. Required to predict viscosity evolution in both RAVEN and COMPRO, as well as to predict saturated resin flow in COMPRO. Required for residual stress and deformation predictions in COMPRO. RAVEN has moderate requirements on computational resources. RAVEN runs under Microsoft Windows (XP, 7 or 8) and performs well on nearly any computer that is less than five years old. A minimum of 2GB of RAM is recommended for a good user experience. The table below compares the typical user and analysis capabilities of our software products RAVEN and COMPRO. Requires familiarity with finite element analysis. Some attributes are analyzed directly (e.g. local thickness and fibre volume fraction) and some indirectly (porosity). Copyright © 2019 Convergent Manufacturing Technologies Inc. All rights reserved.